Yala National Park is world renowned as one of the best parks to observe and photograph leopards. Although it has one of the world’s densest leopard populations, it still requires good luck to see one of the elusive creatures in its natural habitat. Bundala Bird Sanctuary is a haven specially for many waders and migrant birds who migrate from late October and leave in March-April. The sanctuary which constitute of Salt lagoons, Marshy Land and sand dunes make it an awesome place to visit. In 1991 Bundala became the first wetland to be declared as a Ramsar site in Sri Lanka. In 2005 the national park was designated as a biosphere reserve by UNESCO. Kataragama is a Hindu and Buddhist temple complex dedicated to Skanda-Murukan also known as god Kataragama. It is one of the few religious sites in Sri Lanka that is venerated by the majority Sinhala Buddhists, minority Hindu Tamils, Muslims and the indigenous Vedda people. The Tissamaharama Raja Maha Vihara is a Buddhist temple in Tissamaharama. It was built in the 2nd century BC.The Tissamaharama stupa which is situated in the premises of Tissamaharama temple is one of the largest stupas in Sri Lanka. 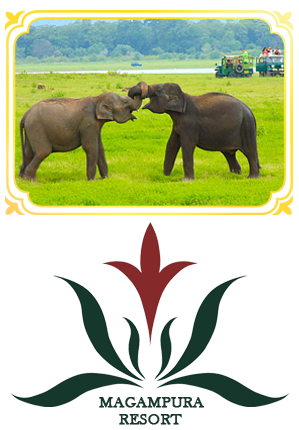 Udawalawe is an important habitat for Sri Lankan elephants and also a good bird watching site, which are relatively easy to see in its open habitats. Many elephants are attracted to the park because of the Udawalawe reservoir. And also close proximity of the resort, Sooriyawewa International cricket Stadium, Magampura Convention Hall , Hambantota Harbour as well as Ranminithenna Cinama Village are located.